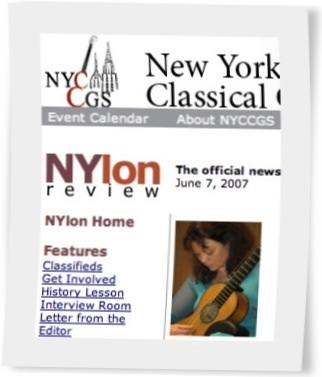 Author Andrew Dickenson is Editor-in-Chief of the NYCCGS's newsletter NYlon review. 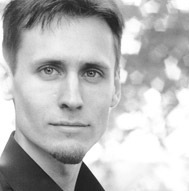 Andrew is also member of the New York Guitar Quartet. The daughter of a sculptor and a violinist, Raphaella Smits grew up in an artistic family that noticed at an early age she had a natural proclivity towards music. After mastering the entire family of recorders and singing in choir, her parents surprised her with a present that would change her life: the guitar. Since taking up the instrument, Smits has won competitions, recorded 15 CDs and LPs, and has traveled the world giving concerts and recitals. On March 23, NYCCGS will welcome her to New York for a enchanting evening of virtuoso guitar. Before learning guitar, I read that you played violin and sang, but it sounds as if you couldn't keep yourself away from guitar. What attracted you to the instrument? Well, first of all it was my father and my brother who played the violin. I started my musical experiences with singing and playing the whole recorder family. Two months later, I received a Segovia LP and that made me fall in love with 'guitar music.' Another six months later I started with proper guitar lessons. One and a half year after I got my first guitar I played 'Sound of Bells' by Guiamares, 'Mi Favorita' by Daniel Fortea and 'Jeux Interdits' arranged by Yepes. It was only after participating at an international competition (Granada 1981, 3rd Prize with the warmest compliments of Andres Segovia, president of the jury) that I realized that the combination of me and a guitar was something special. Do you still feel that pull towards the guitar? Can you ever imagine not playing guitar? The attraction never weakened. And no, I can't imagine not playing the guitar. When circumstances keep me away from it I feel miserable. How did knowing other instruments help you when you learned guitar? Singing and playing recorders (like any other wind instrument would) developed my ability to catch the right breathing or respiration: a vital element in performing any piece of music. Besides that, singing in choirs and playing in ensembles has stimulated my feeling for polyphonic music and made me a good chambriste. You play a lot of early music as well as multi-stringed guitars. Can you describe the instruments that you play? Indeed I do play a lot of different guitars: 8-strings, old (Vicente Arias, 1899) and new (John Gilbert, 1980 / Kolya Panhuyzen, 2006), 7-string (Mirecourt, 1827) and 6-string (Francois Roudhloff, 1830). For technical details I like to refer to my website (www.rsmits.com). Why do you enjoy exploring more than just the six-string repertoire? I could simply say that I have a soft spot for basses, but there is more to it. My aspiration is to make music to the best of my ability. Read: I aim for an authentic execution. Making music is like a journey: on the road I meet interesting scores, instruments with different qualities, the better kind of strings, locations with brilliant or fussy acoustics, etcetera. As a musician I take the challenge to combine all given elements into an impassioned performance with all due respect for the composition. Knowing that a lot of (guitar) music is written for more than six strings, it is obvious that I will use the proper instrument whenever I find a guitar that matches the repertoire at hand. I prefer to play seven- or eight-string guitars, rather than arranging the score for only six strings. Moreover, there is this miraculous process. Getting to know another guitar is an exploration over time. On closer acquaintance I discover gradually the strengths and the weaknesses of the instrument, its possibilities and its threats. The achievement of a beautiful sound results from constant attention. So I learn I have to adapt my technique: a different position of the right hand sometimes produces a richer color, sometimes a poorer one, but by doing this I discover a new aspect of the instrument... and consequently a new depth of the music. It is fascinating to realize that, thanks to my technical researches into different instruments, I have succeeded in expressing with evidence the various characteristics described in the music I play. Have you run into any problems when traveling with your instruments? It rarely happened since I'm a professional musician. I remember though, when I went to Spain to participate in the Francisco Tarrega Competition in Benicasim, I arrived without my guitar: it was lost! Lesson learned, at my next trip (to Portugal) I refused to hand over my guitar to put in the luggage compartment. I had to use the female power of persuasion (lots of tears!) in order to keep my instrument with me during the flight. Have you discovered or heard any new instruments that you'd like to learn how to play? Should I ever find the time I might pick up the vihuela. It has a lot of repertoire that - in my humble opinion - doesn't go well on the guitar. We'll see. What music will you be performing at the NYCCGS concert? Leo Brouwer: Tres Apuntes, Wim Henderickx: In deep silence, Owe WALTER: La Guitarra, Johann Sebastian BACH: Partia secunda a violino solo senza basso (transcription by myself). Is this music that you've played for a long time, or is any of it new repertoire? Most of the program is new stuff. There is even a US premiere for In Deep Silence of Wim Henderickx. La Guitarra of Owe Walter I have put on the program again after a period of rest. The same goes for the Ciaconna of Bach. How is performing music that you've known for a long time different from performing newer music? Performing music that I've known for a long time is a twofold experience. It's fine to rediscover the things I once saw on a previous journey, but it's even finer to go deeper and explore new layers in the composition. Like now that I'm playing the whole Partita, as a result I see the Ciaconna that I played before in a new light. Fascinating!